At RV Law, we represent lenders who have advanced money secured by a mortgage. We know that our clients demand a law firm that will deliver a high standard of service in transactional work and in litigation. We have a reputation for professional and ethical service throughout every case and for every client, regardless of how that case ends up being resolved.Throughout the Greater Toronto Area, Mississauga, and the surrounding communities of Ontario, we help people who need mortgage enforcement assistance. For more information about our services, please contact us to schedule a consultation today. 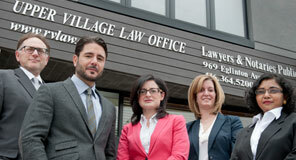 Our Toronto mortgage enforcement lawyers take necessary steps to protect our clients’ rights as lenders. We look at each situation on a case-by-case basis and try to find creative solutions that will satisfy their business goals and needs. We pursue all remedies available by law based on common law and statutory law. For instance, since a mortgage is a type of encumbrance on the property it is registered against, and represents security for the debt, we can file an action to have this enforced. Additionally, separate and apart from the security, a mortgage is promise to pay. If a mortgage goes into default the creditor can collect on that payment by selling the real property and/or by getting a judgment on the promise to pay. We can help you pursue this option. We can furthermore service our lender clients in a foreclosure action. Foreclosure is a legal proceeding commenced against the defaulting borrower or Mortgagor resulting in a court order permitting a Mortgagee to repossess the mortgaged property. Foreclosure may be an appropriate alternative to proceeding by way of power of sale in circumstances where a Mortgagee is likely to experience a loss through sale of the mortgaged property or where other circumstances render sale of the property impracticable. If sufficient time has elapsed and the debtor has not paid back arrears, we can help you start legal proceedings to take possession of the property. If judgment is obtained, our creditor client takes possession of the property and sells the property. If there is a deficiency on the sale our creditor client may look to the principal borrower and any guarantors to pay since, under power of sale proceedings, borrowers and guarantors remain liable for any of the Lender’s losses. In a foreclosure, the debtor can be asked to pay the shortfall only up until obtaining a final order of foreclosure. Despite being able to seek further losses from any debtors after closing on a power of sale, a Lender is obligated in the first place to sell the property for the highest price which the market will bear. The obligations on an enforcing Mortgagee or Lender are many and our office is equipped with the professional legal counsel and staff required to carry out enforcement measures in the most efficient and worry free manner possible. At RV Law, we place our clients in a good situation to be proactive to enforce the security of your property and investment. For more information regarding our mortgage enforcement services in Toronto, contact RV Law and schedule an initial consultation. Call our office at 416-364-5200.